Just two minutes of stair climbing a day can prevent the pound of weight that the average American adult gains each year. But, knowing that, or seeing a sign asking you to take the stairs, is generally not enough to make someone take the stairs. Centrally located, spacious, appealing staircases will encourage use.There’s a “movement” underway to transform dark, hidden stairwells into prominent, spacious, inviting staircases filled with natural light. The stairway renaissance not only provides health benefits, but saves energy, provides vertical flexibility and connectivity, and improves workplace efficiency and overall occupant safety. 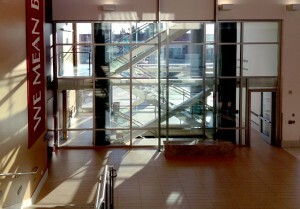 Active design seeks to convert stairwells – originally conceived as rarely-to-be-used contingencies – bare and unappealing, the doorways solid and downplayed into well-designed stairways with fire-rated windows and framing that let in daylight, carry corporate branding, and provide added access for building occupants to use in an emergency. Today’s fire rated glazing and framing products offer building materials that support design efforts to make stairs more visible, appealing and fire- and impact-safe. The active design movement started in 1990s when the Center for Disease Control and the Robert Woods Johnson Foundation sponsored studies linking inactivity to obesity and illness, and by others interested in designing buildings that conserve energy, and promote collaboration, workplace efficiencies, community and safety. Recent progress in making stairways prominent has been spurred by policies adopted by the U.S. General Services Administration (GSA) and Mayor Bloomberg, and well-publicized active design projects created by leading architects. Commercial buildings account for 35% of total U.S. electricity consumption, and elevators use 10% of a building’s energy. Cutting elevator use saves electricity and money. Projects seeking LEED credits can obtain an Innovation in Design credit for promoting routine stair use which promotes indoor physical activity, and other LEED credits for energy savings. Health by Design. In 2013, New York City’s Mayor Bloomberg issued an Executive Order to require all city agencies to use active design strategies in all new construction and renovation projects in order to get people moving. 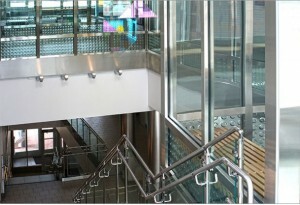 The Active Design Guidelines published in 2010 include a requirement to “focus on stairs rather than elevators as the principal means of vertical travel for those who are able to climb the stairs.” In high-rise buildings, the Active Design checklist requires an integrated vertical circulation system that incorporates stair use between adjacent floors. Dr. Karen Lee, a New York City official who helped develop the Active Design Guidelines cited the rapidly rising rates of obesity and chronic illnesses directly linked to inactivity and poor diet as urgent reasons for rethinking aspects of the built environment. Stair climbing burns more calories than jogging. A study of 10,000 men showed that climbing 20-34 stairs a week (or 3-5 flights a day) reduces the risk of stroke by 29%. “When staircases with innovative design features are placed more prominently within a building, stair use goes up 72%,” said Dr. Lee. Vertical Flexibility and Connectivity. Bob Peck, who currently works at Gensler and formerly served as the head GSA’s Public Building Service sees other benefits of internal stairways. “We workplace strategists and designers have learned how to create office layouts that optimize space utilitization, flexibility and efficiency,” wrote Peck. “But, we’re still vertically challenged: we haven’t solved flexibility and connectivity in the critical vertical dimension. How can we overcome this vertical challenge? Of course, the answer is stairways. But not stairs as we currently design them.” Peck goes on to discuss how the use of open stairways can increase visibility and transparency between floors in ways elevators cannot. “Chance encounters happen. Communication and ideas flow.” Peck should know. He oversaw the conversion of the GSA’s 1917 headquarters building in Washington D.C. An internal stairway tied together two floors of top level managers into one. Occupant Safety. Better designed stairways with wider steps, natural light and openness to building interiors are safer. When the Architectural Team in Boston redeveloped the 1939 Homes at Old Colony, a public housing project, they removed dark isolated stairways and replaced them with stairways filled with natural daylight that opened to lobbies. The result is that residents are safer and more connected to the community. And, by adding additional, spacious, accessible stairways leading to exits and built to code using fire-rated glass and framing, you improve emergency exit safety in the event of a fire. Workplace Efficiency. Walking up or down stairs is faster than taking the elevator, without even accounting for elevator waits or distance to the elevator or stairway. To ascend one level via an elevator takes 36 seconds and to ascend one level via the stairs takes almost a third less time, 13 seconds. Studies show that this efficiency is especially vital in hospitals where health care workers, like respiratory therapists and pharmacy techs, can better serve patients using the stairs between physical units lying on top of each other. For new construction and major renovation projects, prominent stairways can be integrated seamlessly from the start. But, what about existing buildings? How can stair use be promoted at minimal cost while meeting building and fire safety codes. Gensler’s Bob Peck points out that there is an economical way to transform existing fire stairwells into attractive, inviting stairways favored by active design. He suggests that “fire doors can be appealing, with glass panels, glass sidelights and signage. The stairwells themselves could have fire rated windows to let in daylight and could carry corporate branding. The doors could even be on hold-open devices that would automatically close them in the event of a fire. The New York City office of Perkins + Will recently opened a 700,000 sf police academy headquarters in Queens, New York. Described as a skyscraper on its side, “the building is designed for stairs to be the primary means for people to be moving anywhere,” said project architect Joan Blumenfeld, who also served as president of the New York chapter of AIA and worked with the Bloomberg administration on the Active Design Guidelines. Blumenfeld pointed out that New York City’s new construction codes permit buildings to use fire rated glass doors and smoke activated automatic closing devices, which allows as many stairwells as possible to be visible and more inviting to building occupants. Active design principles and projects are taking root in federal buildings and some areas of the country like New York City. This trend is not yet at a scale needed to give everyone access to buildings that promote stair use for energy conservation, health benefits, workplace connectivity, efficiency and improved safety. But, fire rated glass and framing is available to ease the transition by making stairway open and appealing cost effectively. Peck, Bob, Gensler Blog, Vertically Challenged: Stairs, the Final Frontier, February 26, 2014.